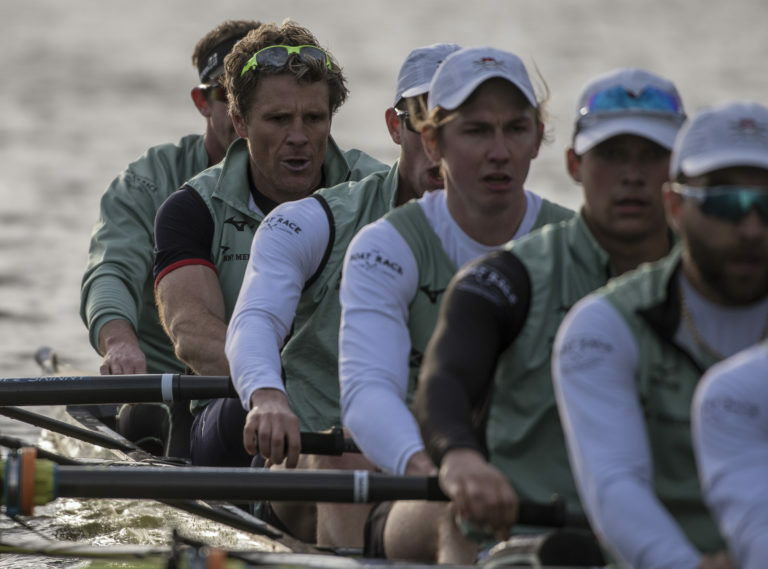 Of all the challenges facing double Olympic champion James Cracknell OBE when he decided to trial for the 165th Cambridge Blue Boat, the last one you might have expected was that a familiar figure could pop up in the umpire’s launch to spoil his day. Former crew-mate and partner in Olympic crime Sir Matthew Pinsent has for some time been a fixture on the panel of officials adjudicating the Boat Races, and since it was Cambridge’s turn to choose from the set of Dark Blue referees, it was a possibility. “Matt texted me and said ‘am I umpiring you?’ and I said ‘I hope not!’ — because he’s umpiring Isis-Goldie”, revealed Cracknell, chatting with a round table of journalists in the Goldie boathouse earlier this week. He was sitting under the 159 Blue Boat honour boards — CUBC are somewhat behind in getting the signwriting up to date — which adorn the room’s pitched ceilings and to which he hopes to add his name, preferably with a ‘WON’ line at the top, rather than ‘LOST’. The other end of the boat, that is. 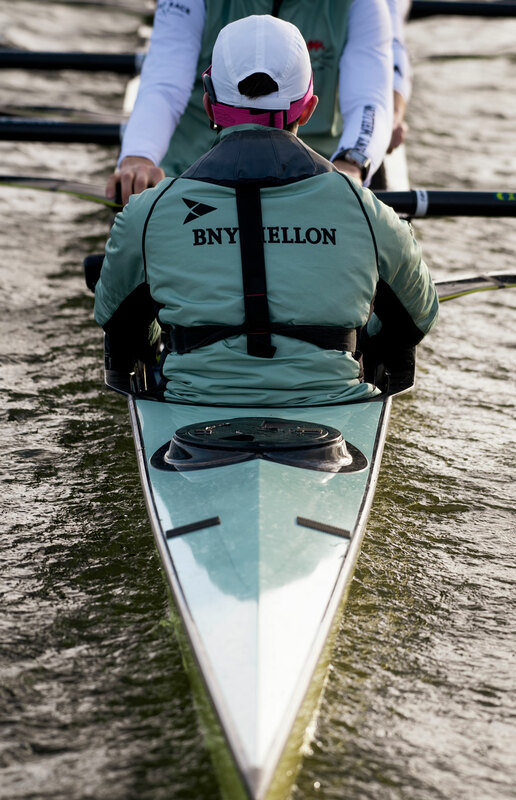 Cracknell has bagged — barring late changes — the two-seat of the Light Blues’ top crew, after a busy year which has seen the 46-year-old return simultaneously to full-time education 25 years after writing his last student essay and to full-time rowing training 14 years after retiring. From the outside, it does look like a mildly vainglorious bid to recapture youthful success, and rowers up and down the country hold a range of views on the wisdom of the attempt. But he’s quick to explain that there was a lot more to the decision, based partly on his recent work for the independent right-wing think tank the Centre for Social Justice, and interest in a politically active career. “I was doing quite a lot of work with public health and non-communicable disease, and policy change”, he explains. “A lot of it’s about behavioural science and how we have learned behaviours, and to make sure policies are written for people to have interventions to make the right decisions. It’s no good writing policies for food we should eat when in reality 20% of the country only have a toaster, a kettle and a microwave to cook with.” Realising that an academic background would lend him more weight, he decided to go back to college to support this work, which led to his application to study for a ten-month MPhil in human evolutionary studies at Peterhouse College. In practical terms this year has thrown up a series of unexpected challenges, from discovering that none of his team-mates were alive when he went to watch a Kurt Cobain gig as a 1990s student, or learning about Tinder, to turning up at his first lecture with especially-sharpened pencils and paper, only to find the rest of the cohort taking notes on their laptops. As he points out, “the internet wasn’t around when I first went to university”. Unused to a full academic schedule, he was left behind a few times in the early weeks, when his squad mates left the Ely boathouse to rush back for morning lectures, before he had finished changing. 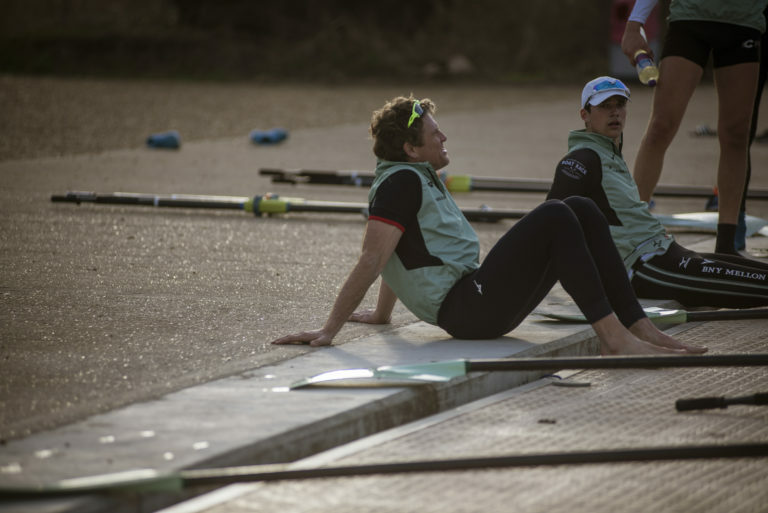 As a full-time student he’s living in Cambridge, away from his West London home with wife Bev and their three kids, but has managed a few nights with the family when CUBC have visited the Tideway on their many training outings to accustom newcomers to the bumpy water. It’s fair to say that taking part for real has changed some of Cracknell’s views of the odd and historic event which is the Boat Race. He commentated on and wrote about it many times, but now he’s heard the tales of former Blues. “Looking back now I realise how little I knew about the race while commentating on it. It’s the subtleties, the old boys come back and talk about it, at key points what they were thinking. The amount you have to practice: getting onto the stake boat and having a 5mph current running underneath you. You can muck it up by the first stroke of the race: it’s like getting dropped onto a treadmill when it’s running already.” He also appreciates now the complexity of preparing a crew with wildly differing levels of experience. 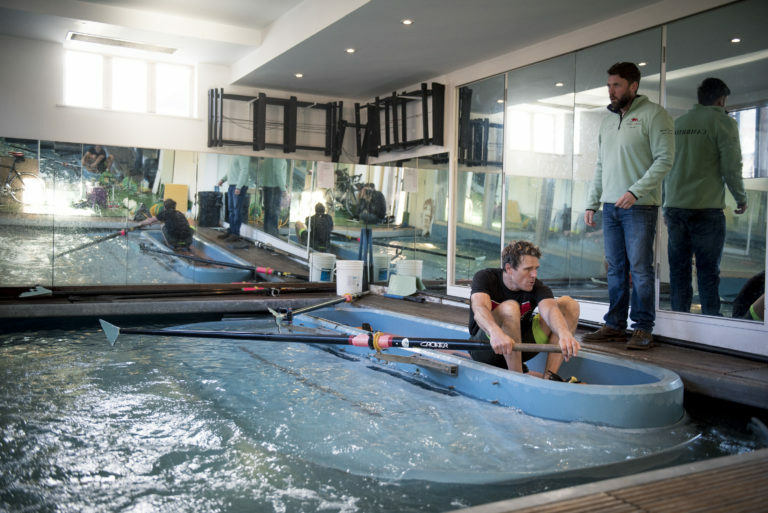 “In the Olympics everyone’s pretty much the same sort of area of racing, whereas here you’ve got people who started rowing at university, through to Natan [Wegrzycki-Szymczyk] who’s raced for Poland at the Olympics. He’s very racing-aware but clashing is not his natural forte. 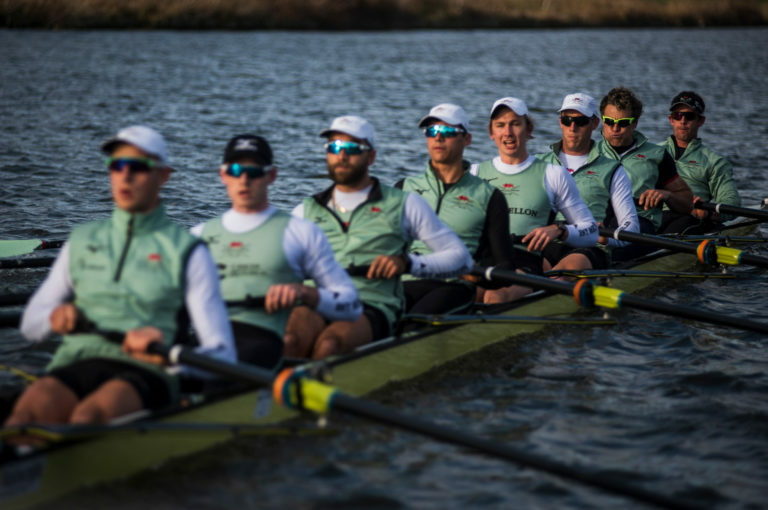 But I’ll be really disappointed if we choose a side where I don’t get to clash.” Fortunately they’re rowing on opposite sides, so Cambridge will clearly be hoping to get the Mortlake station, to keep both their Olympians happy. Cracknell has also changed his mind about coxes — for this event, at least. “When I raced the Olympics one of us would steer with our foot. Normally a cox is a 50-kg bag of sand, if you can do their job with your foot they’re not that useful. But on the Tideway they earn their keep probably more than anyone. You’ve got to have real faith in them, and communication between stern pair and the cox is crucial. But the people up the bows have got to be switched on as well. Especially where I’m rowing, I’m one of the last two guys to see if Oxford are going to break clear so if there’s going to be a make or break move it will come from one of either me or Dave [Bell] shouting ‘it’s going to be now or never’”. To Baker, it’s pointless comparing his two-seat, nicknamed ‘Uncle James’ to the crew, to other 46-year olds. 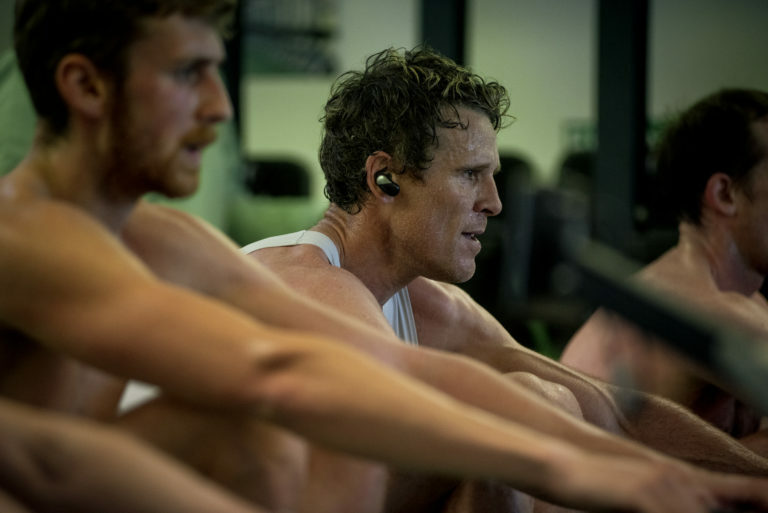 “Andrew Cotter the race commentator was saying we all feel ourselves slowing up when we get into our forties, but we weren’t all James Cracknell in our twenties and thirties. He isn’t producing the scores he did when he was 25-30 but he was one of the top gold medallists then, not just getting gold medals, but one of a handful of people in the world, so it’s a very high bar he starts from.” What the returner does have is the same fearlessness he showed when younger. “I don’t think James is afraid of hurting himself, or ever has been.” That’s lucky, since this year Baker started training with a suggestion that anyone who stopped on the erg test which formed the first session, should not bother coming back. However he has worked hard to his raw strength and technique, and seems to have timed his peaking with the canny accuracy of experience.